Today’s Nice Price or Crack Pipe Renault A110 was actually Hecho en Mexico. That makes it far more rare than its French cousin, but will this restored example still prove worth the dinero? Wow, it’s been a rough week here for cars both eclectic and sober. We haven’t had an opportunity to shout winner, winner chicken dinner since all the way back on Monday. Despite a noble effort, yesterday’s 2005 Volkswagen Passat TDI fared no better than those that came before it, and it dropped in a 62 percent Crack Pipe loss for its $5,999 asking. Along with that oily wagon we’ve had a couple of exotics this week—an old and frumpy Maserati 4D and some French forbidden fruit in the form of a Renault Clio V6 that had questionable immigration papers. That Renault didn’t prove to be French in action, but maybe this 1972 Dinalpin A110 will entice you to run for the border, the Mexican border that is! That’s because the Dinalpin is a Mexican version of the Renault-based rally rocker, the Alpine A110. Alpine seemingly wanted to see the world, and they built cars all along the way while on the tour. That ended up with the company partnering with local assemblers around the globe, nominally to get around onerous import tariffs, but also to expand the number of cars that could be built outside of the constraints of Dieppe. The preceding A108 was built in Brazil in partnership with Willys-Overland and marketed as the Willys Interlagos. In Mexico the company also partnered with truck and bus maker, Diesel Nacional (DINA) to built the later A110s. They started cranking out the cars in small numbers at their Sahagun factory starting in 1965. This 1972 A110 still calls Mexico home, as it’s offered for sale in the North American nation’s capital, Mexico City. The white over black sports car is claimed to have been fully restored and sports a 1,255 cc, 105 horsepower edition of the R8 Gordini motor. That breathes through a Weber side draught two barrel and expels the end results of its efforts through tubular headers. The engine compartment and the mill itself look to be complete but the appearance is far from “restored.” There’s chipped paint all over, an alarmingly corroded distributer body, and a seemingly fanciful collection of fasteners holding things together. Ah well. The interior seems to hold up its end of the bargain better, featuring clean upholstery, a fitted roll bar and a lovely wood-rimmed Nardi wheel in front of a five-gauge dash festooned with a bit of real wood. Some switches appear to have gone missing in the refresh as there are a couple of open spots on the roster there. Transmission duties are carried out by a four-speed transaxle operated through a nubby shifter on the narrow tunnel. A110s were built out of fiberglass on a steel central tube-based chassis. The bodywork here looks to be in fine fettle with all its glass and plastic, bright chrome on the bumperettes, and appreciably good rubber. The paint appears to be fresh with only some stress cracks in the inner doors to detract. Thirteen-inch alloys underpin the car and you’ll be amused to note they only feature three lugs evidencing their pedestrian roots. It’s hard to say just how many Dinalpin A110s were built over the course of the 10-year partnership between DINA and Alpine, but the numbers are rumored to be far fewer than the approximately 7,500 built in Dieppe. That makes the Mexican edition a super rare rally car, and hence even more storied. And that of course means big bucks in today’s world. 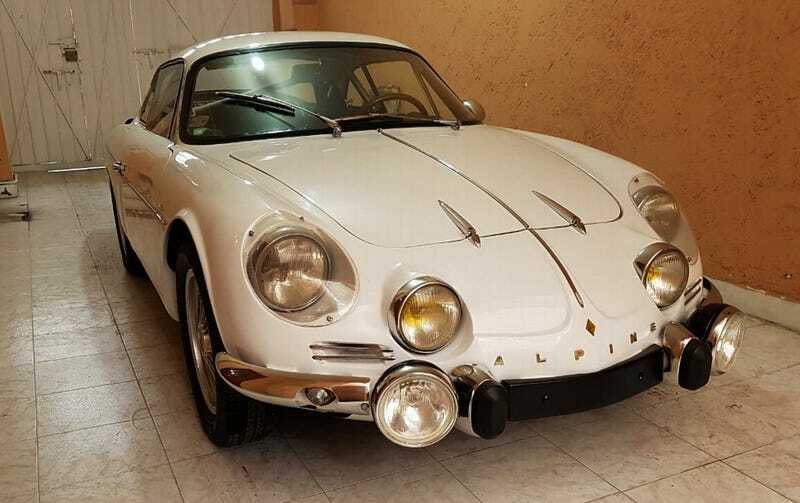 In the case of this A110 that means an asking price of $55,000US. eBay out of Mexico City, Mexico, or go here if the ad disappears. H/T to Scott Ruch for the hookup! For $5,999, Could This 2005 VW Passat TDI Be Passable?